I'll check out the tread. While researching DIY heated build platforms for 3D printing, I came across a guy who printed a piece of cable chain with his 3D printer. To me, cable chains are an absolute necessity in building a clean and orderly machine, however it uses precious motor torque to push those cables and chains. This is basically a note to myself, because I thought it was a fantastic idea, however, hopefully others will find it of interest. Although this project has been sidetracked for quite some time, I will now be bringing it back to life. And although I still need to create several PCBs for this project, I have decided to move forward on the extruder design of Post #269. As it stands, I have all the necessary materials to construct the extruder, however I am still undecided about whether to assemble the hot end with a press fit or some high temp solder, however I am leaning towards some silver solder, but I still need to do a little research. For today, I will be cutting the necessary metal blanks, doing my solder research, and attempt to get something done on the hot end. I am hoping that in the next several days, I will be able to show you a working example of my extruder design. EDIT: And hopefully, I will be able to control it with the CNC/3D Printer controller that I constructed from a Propeller Proto Board, but I will have to review the status of that project, just to see if it is currently possible. Information and a link to the thread about that controller can be found in Post #271. Well I did not get anything done yesterday, because of research and indecision concerning the hot end. To be perfectly honest, I am not quite happy with the two screws holding the hot end. For one, the tolerances are very tight to make it fit properly, and secondly, it makes the construction of the hot end a bit of a pain. Additionally, the cost of silver solder has made the construction of the hot end with solder cost prohibitive. So instead of soldering everything, the parts will require a press fit and I had to order a 6.3mm drill bit for that. So in conclusion to my first attempt, I will be press fitting the hot end barrel into the nozzle and I will also be attempting to press fit the barrel into the thermal isolator. The press fit into the thermal isolator will most likely be the weak point of the whole assembly, but hopefully it will hold up. So instead of fighting two tiny screws for hot end removal, the thermal isolator will now become part of the hot end, and the entire hot end can be attached or detached with the two thermal isolator mounting screws. I am not sure if this will work out or not, but I think I will try this first. Instead of rushing into the construction of the extruder, I took another day off to think about how I was going to secure the hot end, because once again, I was not satisfied with the idea of press fitting the hot end into the thermal isolator. Instead of using a press fit, I have decided to thread the nozzle/bobbin portion of the hot end with 1/8"-27 NPT threads, which will screw into the thermal isolator. 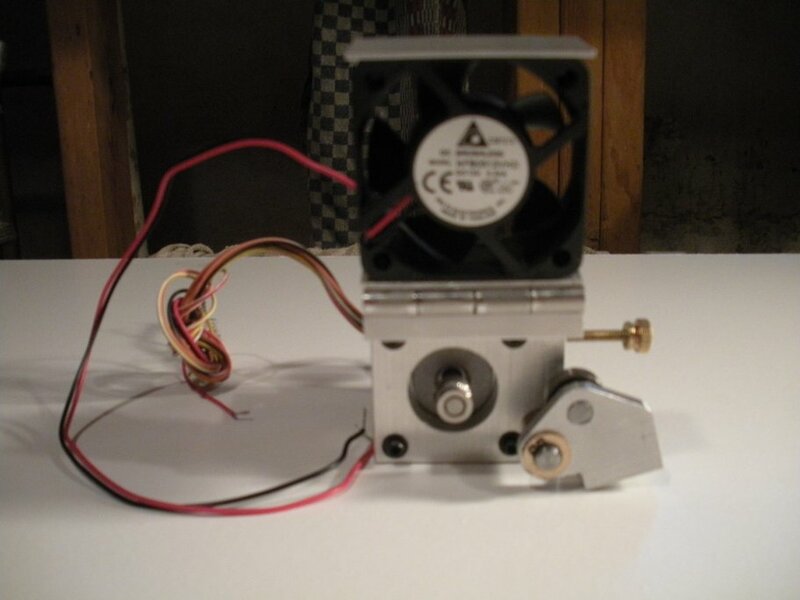 I have attached an image below to show the main alteration to the hotend. Please note that the drawing provided is in a generalized form for ease of clarity. 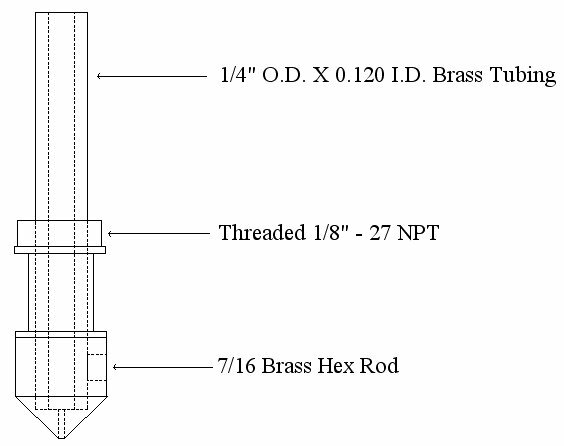 The hot end will be constructed from two pieces of metal which are listed in the drawing. The hex rod will be center drilled with a 6.3mm bit to allow a press fit of the tubing. After pressing the tubing into the hex stock, the piece will be turned to create the resistance wire bobbin area, a pipe thread boss, and the nozzle area will be champhered to 45 degreess. At which point, the nozzle will be drilled for a predetermined orifice size. For the last several days, I have been preparing my extruder parts for further machining. Progress has been slow, but steady, and I keep inching toward making the extruder. Since the 6.3mm drill bit arrived yesterday, I started working on the hot end early this morning. Not much to report on that just yet, but I will keep you posted and provide some photos as I proceed. Alright.... so the 1/8-27 NPT thread for the hot end was a bad idea or let's just say that it was when using a die. I think it would work well if the threads were turned on a lathe. To be perfectly honest, I also did not like that plan too much. My next plan of attack is to put some 1/4-20 threads in the thermal isolator and on a portion of the barrel. Out of curiousity, a drilled and tapped a piece of the thermal isolator (melamine ashtray) and tightened a 1/4-20 bolt to it. I must say that it threads very nice and as I mentioned before, that is some pretty stout stuff. The extruder is coming along nicely, but slowly. At this point, I am just getting ready to drill out the motor mount bar, which will be followed by the drilling of the thermal isolator. After that, the only thing left will be the machining of the tension lever. I should be able to post some photos fairly soon. I think it will look pretty nice, but whether it works like it should, is quite a different story. Sorry for the delay in posting photos, but I got sidetracked by a couple of other projects. Anyhow, I am not finished with it just yet, but I do believe it is worthy of posting a few photos. It is also worth mentioning that a few minor details have changed since the last drawings were uploaded. Instead of me describing the changes, please examine the photos and the last drawings. Another item worth mentioning is that after my first failure of making a hotend, I decided to make everything else first, and so the hotend is not part of it just yet. 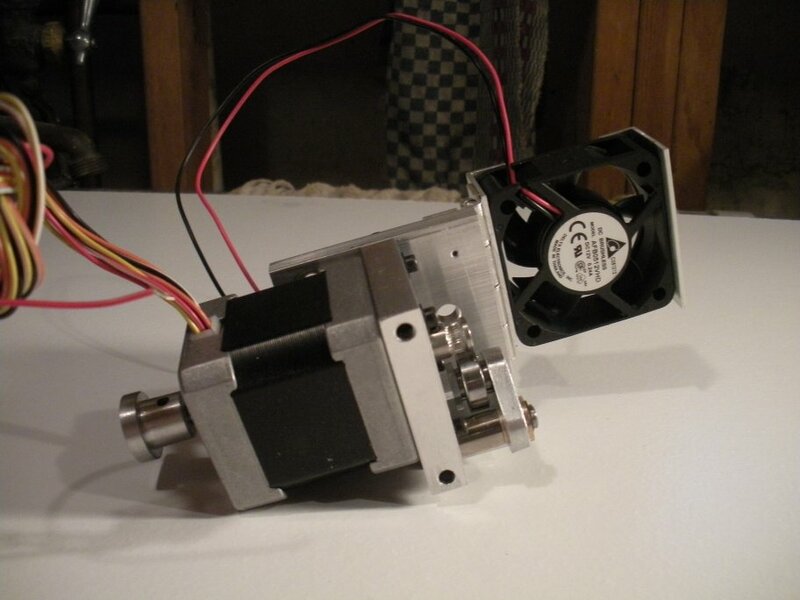 This extruder is turning out to be more of an industrial extruder than a hobby one. 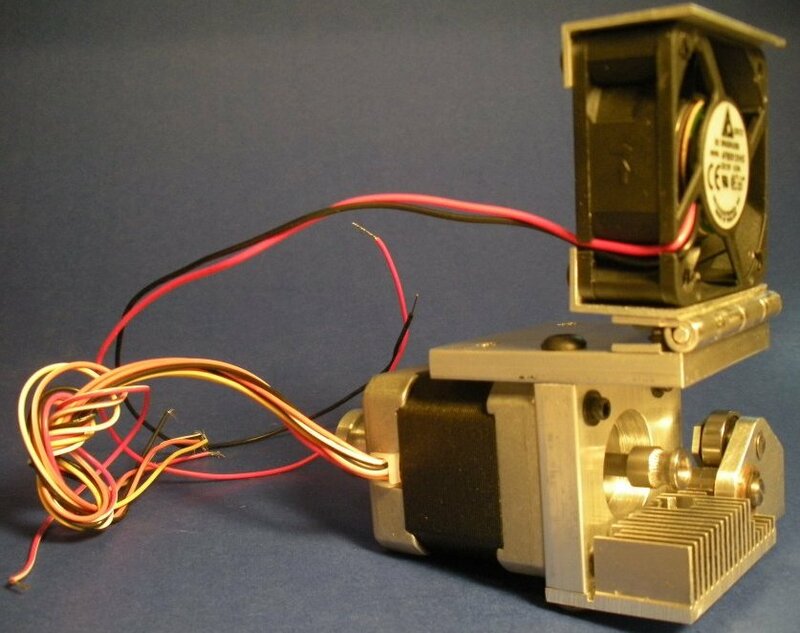 Very stout, sturdy, and with a high torque Applied Motion stepper motor. Good to see some pictures, Bruce. It sure looks sturdy. I really like the way that the fan folds upward and stays in place because of the friction of the hinge pin. By the way, that is the largest fan that I could find in that size, which ought to help cool things down. Sometime later today, I should have everything done except the hotend and a special circuit board that I will be making for the connection of the wires. It won't be long and I should be able to test and dial her in. 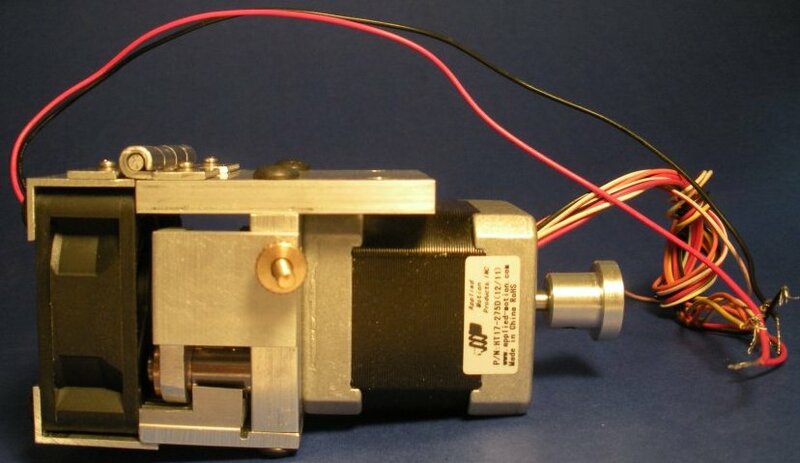 A side note for those that may be thinking about building this extruder. 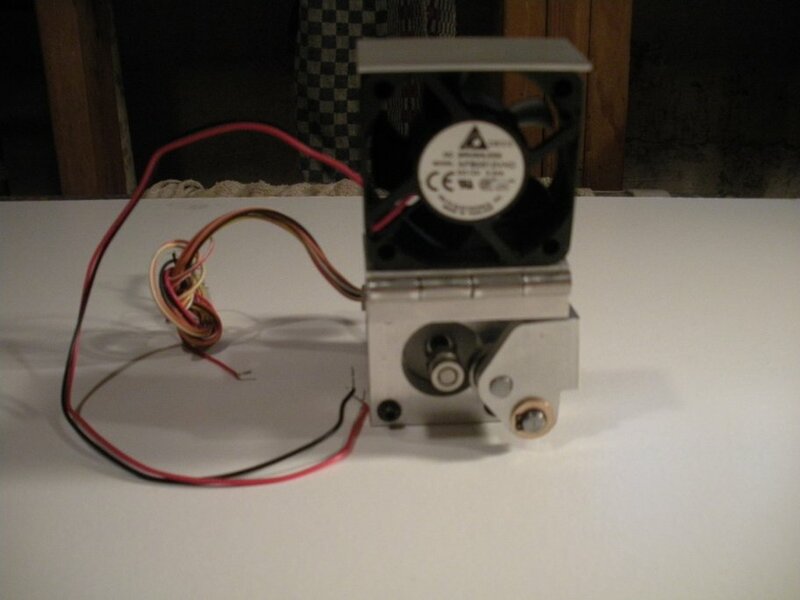 If you decide to countersink the fan mounting holes in the fan mounting brackets, like I did, do not make the final cut on the bottom of the motor mount until you have than fan assembly built and can take an accurate height measurement, because those fan screws have a mind of their own. My calculated fan assembly height was thrown off by approximately 1/16 due to these screws and countersinks, which in turn results in the fan assembly not making contact or the intended tension fit against the thermal isolator. As a result of this oversight, I will be place a rubber shim under half of the hinge, to take up the clearance and provide the fit I desire. This is my plan until I find a thicker thermal isolator. At this point, everything pertaining to the extruder has been done, except for fabricating the rubber shim mentioned in the previous post and making the hotend. EDIT: Oh yea, and of course the special circuit board for the connections. EDIT: However, I have been thinking about using the circuit board as a shim between the motor mount and the thermal isolator. Referring to Posts #283 and #284, after snapping my thermal isolator, by being to aggressive with it, I have decided to abandon the thermal isolator and the tension fit. I will now be making a custom heat sink from aluminum and be relying on a magnetic catch assembly to retain the fan in a closed position. Considering the previous lack of a tension fit and the snapped isolator, I believe this is probably my best course of action. I was of course very close to finishing this project, but before starting work on the hotend, I decided to resolve the issue of the closed fan, which resulted in the snapped isolator and the change of direction. Yea, it's on it's way to being nice. 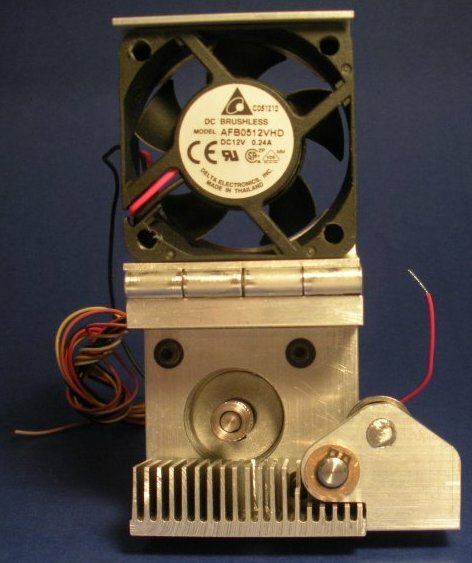 I was thinking of a bolting on a heatsink/hotend setup similar to the one below. 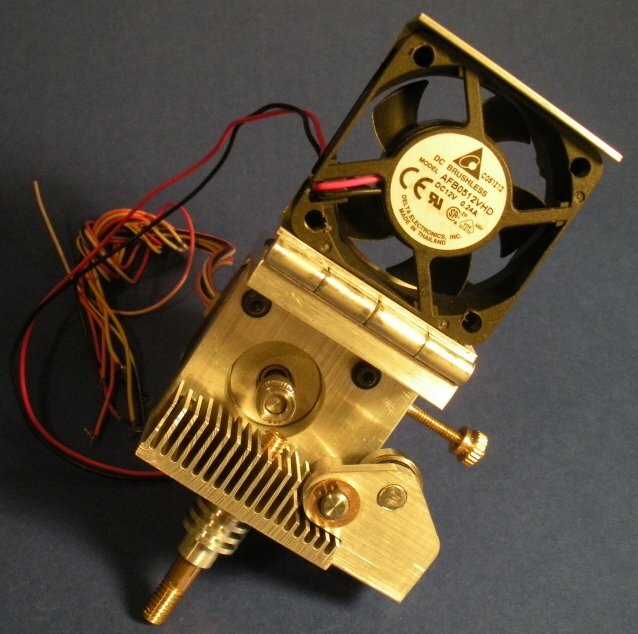 Remaining true to the open source design of the "Drummond Extruder", I am now providing details to the final draft of the heatsink. The heatsink will actually be composed of two seperate heatsinks, bonded together through the mechanical fastening of 1/4-20 threads on the upper portion of the core. 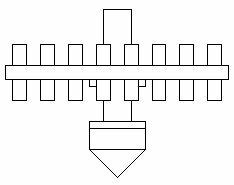 Although the core is not shown in the illustrations below, the core will have an upper threaded portion and a lower threaded portion, and the portion of the core that is unthreaded will be press fit into the lower heatsink and resistance wire bobbin, with the lower threaded portion of the core extending past the bobbin to allow attachment of various nozzles. This assembly can then be threaded into the upper heatsink with the upper threaded portion of the core, being thermally bonded with heatsink compound. 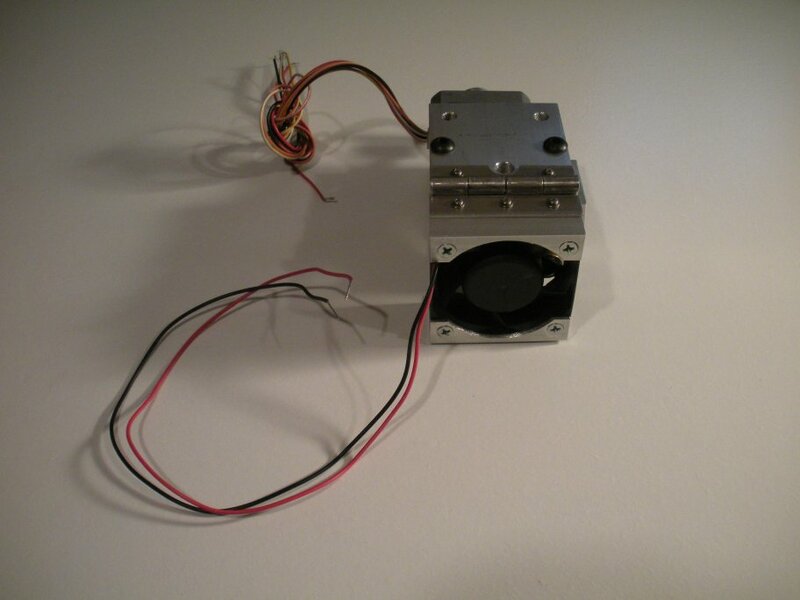 The upper heatsink has two mounting holes, which coincide with the two mounting holes on the underside of the motor mount, and the heatsink will be attached to the extruder by utilizing these holes. The lower portion of the heatsink will rely on open air cooling, while the upper portion of the heatsink will have forced air cooling, and the coolings fins will be right in front of the cooling fan. On the upper portion of the heatsink, there is a channel cut behind the cooling fins, prior to the motor mounting area. This channel is intended to reduce the transferance of heat. The illustration on the left is a side view and the illustration on the right is a rear view. For earlier photos, please refer to Post #280. In the following photos, you will see that I have constructed the upper heatsink referred to in Post #288, and bolted it to the extruder. In addition to that, I have completed a little fine tuning to the tension lever, so that it now opens at a right angle as intended. This baby is real starting to look good, or at least that is my opinion. Since I am in forum, I thought I would make a minor update. EDIT: Now it is time to make the lower heatsink and the resistance wire bobbin. The lower heatsink has now been made. An aluminum blank was press fit onto the core and the assembly was turned to produce the heatsink. The wire bobbin, although not shown, will be made in a similar fashion, and as mentioned, the nozzle will be threaded onto the end of the core. Please note that the wrench flats have not yet been machined onto the lower heatsink. I will complete this operation, after the bobbin has been turned. Additionally, I am not sure if the lower heatsink has too much or not enough aluminum and fins, but I think it just might work. If not, I will just have to make another core assembly. Anyhow, this is the current state of the extruder. Are you sure it's still an "El Cheapo" ? Looks like a lot of work, but could probably be replicated cheaply now that all the engineering is worked out. 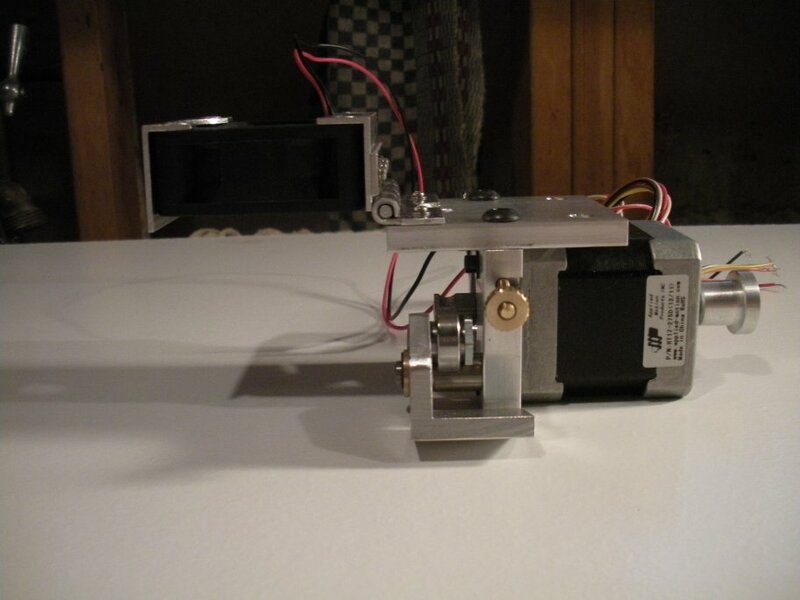 The linear actuators will be the cheap part, but testing them is also the main goal of this project. LOL... I could have built a hundred of the actuators and tested them by now, but then I would not have a nice PCB saw, a new invention for prototyping PCBs, and a unique design for an extruder And in addition to all that, I believe that Propeller controller will work for CNC control. I could be wrong, but I believe I have just wasted several hours worth of work and a little material, due to a design flaw of the hot end. Now I suppose I could go into a lengthy discussion about the theory and thermal dynamics of a hot end, but since I am basically guessing here, I won't bother. However I do believe I have designed a flaw into the hotend and that would be my placement of the lower heatsink, directly against the hotwire bobbin. By doing so, I believe I am robbing precious heat that is required for melting the plastic and essentially heating up the heatsink, when the main purpose of the heatsink is to cool the core. Instead of having the heatsink in direct contact with the hot wire bobbin, I now believe there should be a small gap between the bobbin and the heatsink, especially since I want to cool the core instead of having the bobbin heat up the heatsink. I have included an illustration to convey my point and to show the changes that I will be making to the hotend. I have provided a colored version to aid in the comprehension of this discussion. The grayish colors represent the heatsink which is comprised of aluminum and the yellowish colors represent the core, the hot wire bobbin, and the nozzle, which are all comprised of brass. EDIT: I can't imagine that there needs to be a large gap, and most likely, the gap should be a very short one, so perhaps I might be able to salvage the work I have already completed, by limiting the gap to approximately 1/16 of an inch. Nomex and Kevlar would make a good insulating washer....A cut out from an old "Oven Glove"
1 how many turns of resistances wire? 2 what kind of sensor to use for Temp. feed back? 3 where to put it? 4 what to read and control the Temp. with? P.I.D. can be tricky when everything is home made. The thermistor can be taped directly to the nozzle using Kaptan tape, however, I will be drilling out my nozzle and epoxying the thermistor within that hole. 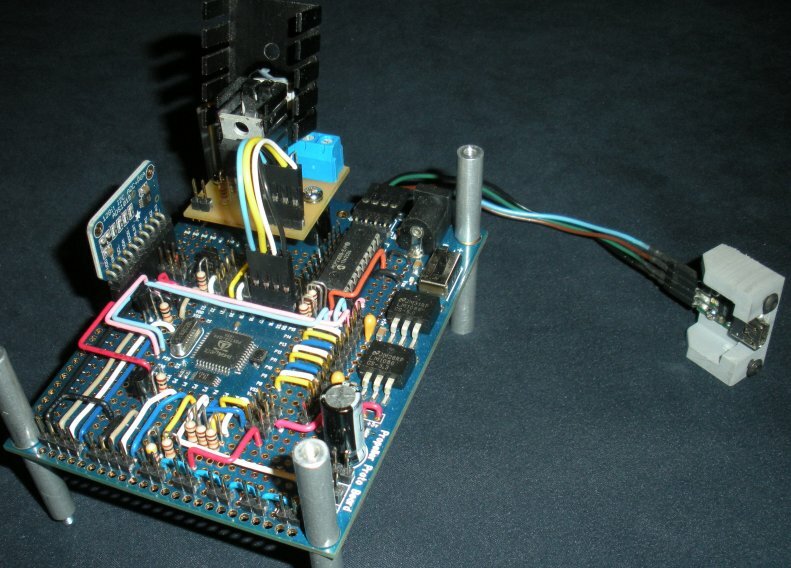 If you look at my controller board, described in this thread: http://forums.parallax.com/showthread.php/155404-Input-Needed-Combining-Propeller-Proto-Board-Prop-DIP-40-and-ADC-for-3D-Printer you will read about and see this breakout board being utilized, or you can simply look at the image below and see the ADC plugged into the controller board. In the thread above, you can also read about the daughterboard that I created for supplying current to the hotend and the hotbed, which is also shown mounted to the controller board below. As for reading the thermistors, there are plenty of tables available from various 3D printing firmwares, which support a wide array of various thermistors. I have done my best to answer all of your questions, but if I was still not clear, just ask me to clarify. EDIT: Walt... One thing to keep in mind, which I have read and which makes perfect sense, it is not the accuracy of the thermistor readings that is important, but the consistency of the readings. Great find on the "of the shelf parts". I've used ADC's for years and I like them. I use the over sample method. Grab a large number of samples and average them. I still see the need for some P.I.D. code to regulate the temperature, Or is this embedded in the 3D-printer software? Disaster struck this afternoon. Just prior to the final machining operation of the bobbin, I forgot to tighten the chuck, and ruined my core, heatsink, and bobbin. Hours worth of work went out the window. That baby was looking good to. I only have enough tubing on hand for one more attempt. There is plenty of P.I.D. code in 3D printer firmware to regulate temperature, however the code that I have looked over is quite bloated, so eventually, I will be attempting to write my own 3D printer code for my controller. OOOPPPSSS.... On second thought, I still need to make a couple circuit boards, before returning to that thread, but I will soon be heading in that direction. Well... I ruined my last piece of tubing.... The good news is that I now have a better plan, so it shouldn't happen again. Anyhow, I hate putting projects on hold, but I will have to put the completion of the extruder on hold, until I get some more brass tubing, only this time, I will order a more abundant supply. In the meantime, I will be making some necessary car repairs, before winter hits, and additionally, I will now be making all the circuit boards for this project.